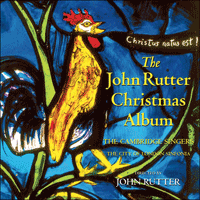 The definitive collection of John Rutter carols and arrangements, this album gathers most of the carols composed by John Rutter over the years, plus a sprinkling of Rutter arrangements of traditional carols, grouped to form a programme which narrates, reflects upon, and celebrates the Christmas story. This album gathers together most of the carols I have composed over the years, plus a sprinkling of my arrangements of traditional carols, grouped to form a programme which narrates, reflects upon, and celebrates the Christmas story. I have always enjoyed carols ever since I first sang them as a member of my school choir, and it was not long before I began to write carols of my own—in fact my first two published compositions, written in my teens, were the Nativity carol and the Shepherd’s pipe carol. This was more subversive than it sounds: at the time, the only officially approved style of composition for a classically-trained music student was post-Webernian serialism, which never appealed to me much, and writing Christmas carols was an undercover way of slipping a tune or two into circulation at a time of year when music critics are generally on vacation. No one seemed to mind, so from time to time I have continued to write and arrange carols, encouraged by Sir David Willcocks, my senior co-editor on several volumes of the Carols for Choirs series. For any musician involved in choral music, Christmas is an especially joyous time, and I am indeed happy that it has played a part in my musical life for so many years.